The development of a full range of top-quality products and the ability to communicate their advantages allow us to engage our customers in a constructive conversation, creating a unique synergy with them. Petra organizes and takes part in many events, always suggesting constructive ideas and leading the way to the creation of an active collaboration with all the participants. We are not remotely interested in augmenting our brand awareness. Instead, we want to express in a simple and clear way our expertise and values, avoiding obscure technicalities. We organize events in our mill in order to share culture in all its forms, and for this reason we avoid using a purely commercial approach. On the contrary, we foster an open dialogue with a heterogeneous group of people: food professionals and technicians, experts from academia, artisans, economists, but also painters, dancers, sculptors, photographers and media experts. fonte: intervista rilasciata a Sara Conti e pubblicata nel 2009 su Dolcesalato - Gruppo Food Editore. Pizza Up® is the Technical Symposium on Contemporary Italian Pizza, created by Chiara Quaglia and Piero Gabrieli in 2007. They wanted to encourage food professionals, and Petra’s team as well, to choose quality in their daily activities: top-quality ingredients, techniques and communication strategies. They started from pizza. In the past, it was considered a humble food and was prepared using bad-quality ingredients. Pizza Up® came to the rescue, highlighting the real nature of pizza: a natural, tasty and healthy food. Only two main ingredients: flour and yeast. Obviously, this revolution started ten years ago in a mill, where the main ingredient is produced. And specifically in Molino Quaglia, and not elsewhere, because this mill combined, and still does today, three main features. Molino Quaglia carefully selects the best varieties of grain and mills them using a state-of-the-art stone milling plant, unique in Italy, which ensures the cleanest flour, eliminating toxins that are dangerous to human health. The common effort of pizza makers who have taken part in Pizza Up and studied at Università della Pizza over the years, together with the collaboration of journalist, technicians, and representatives of academia, led to the definition of the distinctive features of Contemporary Italian Pizza in a Manifesto, a unique example in Italy and in the world, signed in 2012. Pastry best is the symposium on contemporary bakery organized, since 2016, by Molino Quaglia. With this event, Molino Quaglia wants to draw the attention of pastry chefs to the changes on the approach of contemporary customers towards bakery products. Contemporary customers are usually well-educated people, aged between 30 and 50. They are well aware of the importance of a healthy diet and active life to guarantee their wellbeing. They are open-minded and want to try contemporary and innovative recipes, always respecting the seasonality of ingredients. They are willing to move and invest more to eat better quality food. Finally, contemporary customers are very active on social media, sharing their experiences and opinions. In order to attract these customers, pastry chefs need to prepare simple, fresh, and tasty pastry products using natural leavening techniques. Customers now prefer a simple pain au chocolat, pastries with fresh fruit, croissants that are rich in flavor as well as in fibers, light leavened pastry products, or artisanal panettone. They want bakery products prepared following the principles of Mediterranean diet, so they can enjoy eating them without feeling guilty and without damaging their health. This kind of customer needs a competent artisan baker, someone who chooses only the freshest and top-quality ingredients and uses traditional baking techniques. Someone that takes their time to prepare tasty bakery products, without using industrial ready-made products. Traditional ingredients from different territories + ancient techniques of bread-making interpreted with a contemporary twist + a food fair in Este town square with music and talks = a new concept of street food. Bread Religion is the event that reinterprets the idea of street food, detaching it from that of junk food. It was made possible thanks to the team effort of farmers, bakers, cooks, nutritionists, millers, and experts in the use of yeast and in the preparation of dough. In 2013, Petra Molino Quaglia, the web television Mangiadischi and Rolling Stone Magazine gave life to Bread Religion, the itinerant project that has presented the idea of a healthier and better quality street-food to more than 350,000 people. A healthier version of common street-food. This event, held for the first time in Este town square, has involved famous Italian bakers, bread and pizza makers, who prepared pizzas, focaccia, pastries using only fresh ingredients and naturally leavened dough prepared with Petra flour. 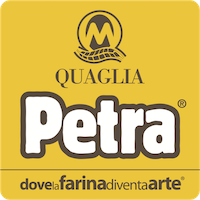 Petra Evolutiva is the flour born from the meeting between the farmer of Simenza, the Sicilian Company of Farming Seeds Association, and the Quaglias, a family of millers. Together they created a flour with a distinctive flavor that changes every year and that brings back the qualities of ancient grain to contemporary cuisine. This flour is milled by Molino Quaglia using the best technology for a clean wheat selection and flour calibration, respecting the climatic selection of crop. The grain for Petra is selected among thousands varieties of wheat grain, sown into the same land for years, with nature selecting the most resistant varieties every year according to local climatic conditions. Only the seeds from the plants that performed well in a specific year will be planted in the field the following year. In this way, wheat becomes naturally resistant to weed and diseases, without resorting to chemical interventions. This innovative process is called participatory plant breeding and it has been studied by professor Salvatore Ceccarelli. It helps go back to traditional and more natural agricultural techniques, while preserving crop biodiversity. Fuori (outside in Italian) is Petra on-line magazine, registered in Milan in 2017. In parallel, Cristina Viggé, the journalist and curator of FUORI, publishes Fuoridime, a blog in which contemporary Italian food sector is described from her particular viewpoint. In Fuoridime, you can find articles, pictures, interviews, news that are told according to Cristina’s sensibility. Fuoridime is the first step towards a more challenging project, a magazine which will reveal the personal side of food chefs. Mamapetra: a new bakery concept allowing bakers to work only in daytime. It was presented on 21st June in Vighizzolo d’Este. (ANSA) - Rome, June 2011 - Mamapetra is a new bakery concept that was presented on 21st June in Vighizzolo d’Este during the 3rd edition of Comunipane, the Technical Symposium on bread, organized by the Accademia del Pane of Molino Quaglia. This new bakery house is designed to produce bread only in day time, simplifying the life of bakers. This new concept offers a great opportunity to involve young people in the rediscovery of bakery traditions, currently facing a difficult time. This concept store has been designed by Chiara Quaglia with Piero Gabrieli and it recreates a homely and friendly atmosphere. The customer can feel at ease in the shop, enjoying genuine and fresh baked goods or bringing them home. FUORISITO is the website where we collect all the news, articles, pictures and videos that talks about Petra world and our Petra Partners. We want to enhance the accomplishments of our partners, giving them the right visibility. Here, the ideas and provocations developed during the courses in Molino Quaglia’s Academy come to life. It is possible to see how food professionals reinterpret the notions and teachings learnt during the training courses by mixing them with their creativity and enthusiasm to create new culinary experiences. Flour and Fire is the name of a temporary art exhibition mixing the art of ceramics with the art of fine cuisine, organized in the mill of Quaglia family in 2006. This art exhibition concluded a convention about the relationship between food and human health, where Petra flour line was presented to media, distributors, artisans and the wider industrial market. Seven years later, we felt the need to collect and celebrate the extraordinary results of the work of Molino Quaglia and Petra flour. Indeed, Molino Quaglia, in collaboration with 60 well-known pizza chefs, were able to crate top-quality dough and leavening methods using Petra flour. For this reason, we made a documentary, entitled Flour and Fire, aimed at food professionals and enthusiasts. This documentary, divided into three parts and shot during Pizza Up event in 2014, presents the quality of Italian pizza as described by well-known pizza makers from Università della Pizza while they are mixing, spreading, seasoning and baking this top-quality food. This documentary takes the spectators along the fascinating journey of pizza making, guided by the expert hands of pizza chefs and leavening-specialist. Pizza is now a complete, nutritious, and light food, made using excellent ingredients and technics that bring on the table the quality of nature. A unique documentary to experience the reality of Pizza Up and Scuola del Molino. Come a casa mia is the space that Petra dedicates to food enthusiasts that use our flours in their home-made recipes. An online recipe book written by people that use Petra flour at home in their daily meals. We search the web looking for interesting recipes featuring Petra flours and we publish them in our website, adding the nutrition facts table. Petraviva project involves the use of whole or grounded seeds and cereals in food preparations and in the Arte Bianca, the Italian art of making bake and pastry products and pizza. Today, Molino Quaglia is the only mill in Italy and in Europe to adopt an industrial sprouting process which respects food safety requirements in order to obtain a flour that is rich in nutrients. This sprouting process is the result of Lucio Quaglia’s intuition, later developed through university researches and the creation of a high- technology production plant. The sprouting process of cereals, seeds, rice, pulses and their subsequent stabilization using a safe industrial process enhance the digestibility and nutritional values of flour.